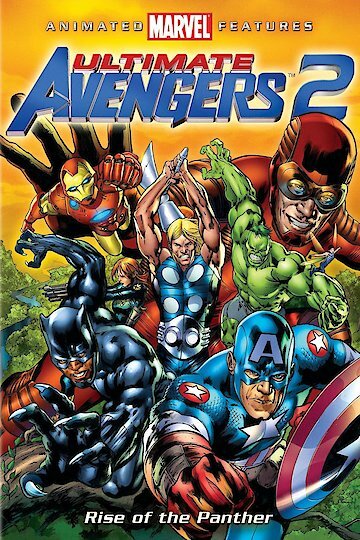 Marvel's Ultimate Avengers 2 continues from the origin stories in the first movie to tell of one of the greatest tests the team will ever face. When Herr Kleiser, a shape-shifting alien working for the bloodthirsty Chitauri, surfaces again after his defeat during World War II, he is attempting to lead the aliens is a takeover of the African nation of Wakanda. T' Challa, the now king of the country and superhero Black Panther, seeks out Captain America's aid. In response, General Nick Fury, director of SHIELD, the global intelligence force known for its stable to superheroes, including the Avengers, gathers Earth's mightiest heroes to fight against the Chitauri in Wakanda. Iron Man, Captain America, Wasp, Giant Man, Black Widow, and, after some time, Thor and the Hulk all head to the country for the fight of their lives. Using knowledge garnered by the Hulk's alter ego, Dr. Bruce Banner, the heroes turn their gamma radiation weapons against the invaders, whose vibranium armor was thought to be invincible. What follows is a massive battle leading up to the final confrontation in the Chitauri mothership above Wakanda.